Scientists have found a potential target for treating up to 40% of breast cancers. A team from Canada's McGill University were able to block the action of an enzyme which fuels the growth of tumours, Nature Genetics reports. 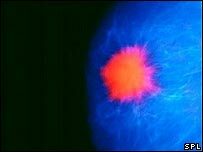 They were able to delay cancer in mice with tumours which also respond to the drug Herceptin, but say other breast tumours may respond too. UK experts said a new drug could boost the benefits of existing treatments. The enzyme studied by the Montreal team was PTP1B, which appears to "remove the brakes" on cell division, fuelling tumour growth. About 40% of human breast cancers have been shown to have excessively high levels of the enzyme. The Canadian team studied a strain of mice prone to develop breast tumours because their HER-2 gene is overactive, as is the case for about a quarter of women with the cancer. These are the women who benefit from the drug Herceptin. The researchers found that deleting PTP1B in the mice led to a significant delay in the onset of breast tumours, and prevented the secondary development of tumours in the lungs. Over-expression of PTP1B has already been implicated in the development of diabetes and obesity, where it shuts down insulin receptors, leading a number of drug companies to develop compounds to block its action. The breast cancer researchers went on to give other mice a PTP1B-blocker developed by the company Merck. This was also found to delay the development of breast tumours and prevent lung cancer. The animals were treated for just two weeks, but the beneficial effects were seen for two months. The researchers say that, because the mice studied were HER-2 positive, the study suggests that a combination of Herceptin and a PTP1B-blocker could benefit a significant number of women, although much more research is needed. Professor Michel Tremblay, who led the work, said: "This study is very exciting for cancer patients. "However it won't cure cancer alone. It's another tool to tackle cancers, perhaps particularly for HER-2 positive tumours. "Combined with Herceptin, it may provide a 'two-way kill'." Prof Tremblay said that, as other research had suggested a greater proportion of breast cancers had an over-expression of PTP1B than responded to Herceptin treatment, other women could also benefit. In addition, other cancers including bone marrow tumours had also been shown to have too much PTP1B, indicating potential wider benefits. Ed Yong, of Cancer Research UK, said: "Drugs that block PTP1B may be useful in treating the disease, but they will first need to be carefully tested in human clinical trials. "Blocking PTP1B could boost the effects of existing drugs that work like Herceptin."